Are there specific indicators you should look for in potential co-founders? That – and much more – was discussed at Stammtisch #56. You’ve got an amazing idea? That’s great, congratulations! But do you also have the team it takes to make this idea successful? Are there specific indicators you should look for in potential co-founders? What about your first employees? And what happens to your own sanity when the company grows? That – and much more – was discussed at Stammtisch #56. 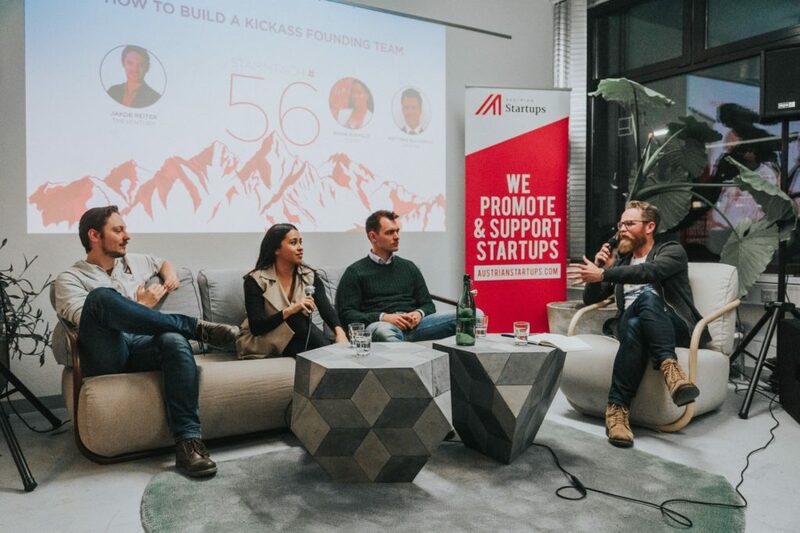 Let’s just say, there is no right or wrong here – judging from the heated discussion between Rhina Portillo, Cozyo, Jakob Reiter, TheVentury and Matthias Blazanovic, bikemap. Friends or no friends, make sure you have contracts in order from the beginning. “You want to draw the papers up in case worst comes to worst, but then you never want to look at them again – hopefully” as Jakob says. Because of course, everything is exciting and everybody is happy doing this together in the beginning, but sometimes, things happen. And you want to be on the safe side, in case they do. You might not save the friendship but the business. Diversity in the founding team is one of the most important things, our panelists agree. “More often than not, you are surrounded by people who all have the same background, but what you actually need are other – complementary – skill sets in your team. And these are hard to find, sometimes”, as Matthias knows from experience. If you want to follow the “Holy Trinity of Founding Teams”, make sure your team consists of a hacker (again, CTO, anybody? ), a hipster – somebody who loves the product, takes care of the UX and knows what the user needs – and a hustler – the manager in the team who takes care of the finances and all that great stuff. Easy, right? So, what makes a great co-founder? Great question! Not so easy to answer! After all, judging from the completely different answers we got to this question. Among others, honesty is an important characteristic. Picking somebody with a complimentary skill set to yours is something you should always keep in mind, too. And going with the financial theme: co-found with somebody who thinks about money the same way you do. But with all these rational decisions, don’t forget about a little craziness either: pick somebody who is just as passionate about making the business happen as you are and join in the craziness together. Thanks to our panelists Rhina, Jakob and Matthias for this interesting discussion AND Das Packhaus for having us! Hope to see you all at the next Stammtisch on April 17 – secure your free ticket now!